Finding an affordable online master's in educational leadership program is the number one priority for many students looking to further their career in the field of education, both in the classroom and at the administrative level. Graduates often work as superintendents, principals, and curriculum developers. Others pursue this master's degree to improve their teaching skills in the classroom. Due to the convenience and flexibility of online degree programs, students can complete their coursework while teaching. This allows them to apply their learning to an educational setting as they earn their master's degree. Balancing school expenses with income is essential for many students, and an online master's in educational leadership program is an attractive option for those mindful of affordability. These programs allow students to maintain their paycheck while cutting ancillary costs such as transportation. Principals earned an annual salary of $90,410 as of May 2012, according to the BLS. Value is also an important consideration. It would be easy to evaluate the cheapest online master's in educational leadership programs by only considering tuition and fees. This, however, would provide an incomplete picture of affordability. It is important to note that the affordability of the colleges we have selected are evaluated on more than just cheapness. Using our new College Affordability Score methodology, we weighed factors such as a school's return on investment (ROI), its track record for helping online students graduate on time, the amount of financial aid given to students, and loan default rates among graduates. The scores determine which institutions offer quality, affordable online master's degree programs, and not just those with the cheapest up-front costs. The University of Florida (UF) in Gainesville, FL, is a public university belonging to the State University System of Florida. UF currently offers more than 100 online degree program options for undergraduate and graduate students. The affordable master’s in education leadership online program at UF is ideal for current K-12 educators who want to advance to administrator positions in their schools. UF’s M.Ed in educational leadership also prepares graduates to pass the Florida Educational Leadership Exam and equivalent exams in many other states. This 36 credit program is designed for aspiring principals, assistant principals, and superintendents. Faculty members have extensive experience in leadership positions at public schools and the highest academic credentials in their fields. UF encourages its online students to stay in contact with their peers using the university’s many available digital communication tools. Thomas Edison State University is a public liberal arts university based in Trenton, NJ, offering associate, bachelor’s, and master’s degrees to students on-campus and online. Thomas Edison’s online programs are designed for professionals who work full-time, and coursework is delivered in flexible, asynchronous formats. Thomas Edison’s M.A. in educational leadership prepares graduates to work in school district leadership and administrators in public and private K-12 schools. Online students select one of three different concentrations in this program: the building leadership concentration is suited for future principals; the district leadership track is designed for future school district leaders; and school business administration prepares students for business administration careers in schools. Depending on the concentration, students complete between 36 and 42 hours to graduate. Louisiana State University (LSU), based in Baton Rouge, LA, is the flagship school of the state’s public university system. LSU is a frontrunner in online education in the state, and students benefit from the large research institution’s ample resources. The online master's in educational leadership is among the many fully online human sciences & education degree options at LSU. The program’s M.Ed in educational leadership prepares students for an Educational Leadership Certification. LSU’s 39 credit online educational leadership can be completed in as little as 15 months, and courses are offered in seven-week sessions throughout the year to accommodate working professionals. Students are also required to complete an independent study -- supervised by a faculty member -- that involves educational research or a practicum experience at a school. With its main campus in Orlando, FL, the University of Central Florida (UCF) is a public university that educates the largest number of undergraduate students in the country. UCF also has thousands of online undergraduate and graduate students. The affordable master's in educational leadership online at UCF offers rigorous courses with a relatively low tuition rate for both in-state and out-of-state students. Graduates of this online M.A. in educational leadership are prepared to be leaders and changemakers in education. UCF’s 30 credit curriculum thoroughly explores educational research and administrative best practices. Students with an interest in higher education administration have the option of choosing a concentration in higher education/student personnel or community college education. Students who opt for the traditional track are prepared for leadership careers in K-12 institutions. California State University-East Bay (CSU East Bay) is a public university in Hayward, CA, and a member of the California State University system. The nine fully online degree programs at CSU East Bay afford working professionals and nontraditional students the opportunity to boost their academic credentials and their earning potential. For current educators who wish to become principals, assistant principals, or higher education administrators, CSU East Bay’s M.S. in educational leadership is one of the finest and least costly online education leadership programs in the country. This 39 credit program delivers coursework on both a quarter and semester schedule. Students must maintain a 3.0 GPA throughout the course of their studies, and are required to take a comprehensive exam during their last semester to demonstrate their proficiency with educational leadership concepts. Students who take specific, additional courses are qualified to earn the Preliminary Administrative Services Credential from the state of California. University of Iowa (IU), located in Iowa City, IA, is the state’s flagship university. The Distance and Online Education Department offers 39 online programs priced to fit the budgets of students and prepares them to be leaders in the field. UI’s M.A. in educational leadership is among the best online educational leadership programs in the country, with a focus on curriculum development, management skills, and leading institutions for special needs students. Online students complete 36 credit hours and a series of comprehensive exams during their last semester. Applicants must have taught at least three years at a K-12 school to be admitted to this program. Iowa residents qualify for Principal Licensure once they complete their required classes and 12 hours of clinical coursework. Western Governors University (WGU) is a private, fully online university in Salt Lake City, UT. WGU prides itself on its affordability and innovative competency-based learning architecture, which requires students to pass competency assessments during their coursework. WGU’s M.S. in educational leadership program prepares graduates to strategically plan, manage, and measure success in education. This leadership master’s degree online is adheres to the standards of the Interstate School Leaders Licensure Consortium and Baldrige National Quality Program Education Criteria for Performance Excellence. Students can complete this 41 credit program in 2.5 years by devoting 20 hours per week to their studies. WGU’s educational leadership program requires completion of a practicum at an approved institution and a senior capstone research project. Florida State University (FSU) is a public, research university in Tallahassee, FL. While FSU is one of the oldest universities in the state of Florida, it is a cutting-edge, progressive institution with a diverse set of degree programs available to online students. FSU’s M.S. in educational leadership/administration program is an affordable, practical option for experienced K-12 teachers ready to take on leadership positions. The program’s curriculum adheres to Florida Principal Leadership Standards and qualifies students from all over the U.S. for administrator positions in private and public schools. FSU’s master’s educational leadership online students complete 33 credits and typically take two courses per semester. Applicants need at least two consecutive years of previous work experience in a classroom. Students take a comprehensive examination before they graduate. University of Northern Iowa (UNI) is a public university located in Cedar Falls, IA. The master's in educational leadership online program at UNI is meant for educators at American International Schools. UNI tailors the program’s curriculum to principals and assistant principals at these schools. The curriculum is delivered in a cohort model, while field-specific coursework and reasonable tuition rates establish UNI as a premier option for this unique set of educators. The 33 credit M.A.E. educational leadership - principalship includes a culminating capstone project. Cohorts progress together over the course of six semesters, and their learning is highly collaborative. Students must have adequate room in their schedules to complete coursework on UNI’s prescribed timeline. UNI recommends that applicants have at least a 2.75 undergraduate GPA and prior experience working as educators in American International Schools. University of Delaware (UD) has a main campus in Newark, DE, with additional campuses throughout the state and online. UD is the largest university in the state and benefits from private governance and public resources to advance academic research at the university. The online M.Ed in teacher leadership at UD prepares graduates for careers as principals, assistant principals, curriculum coordinators, department chairs, and instructional coaches. This program is an affordable online educational leadership degree, with low tuition and several financial aid opportunities available to all online students. Students in the teacher leadership program complete 10 courses, and most students complete their degree in two years. The curriculum is based on the National Teacher Leadership Standards. The school’s full-time faculty members also teach the online courses in the curriculum, ensuring students receive an education comparable to those on-campus. George Washington University (GW) is a private university located in Washington, D.C. The school’s advanced research activity provides GW a global reach, as does its robust online programs in education, the liberal arts, business, and nursing. The online M.A. in educational leadership and administration is fully accredited by the National Council for Accreditation of Teacher Education. The program’s distinguished faculty -- many of whom have extensive experience as principals or administrators at PK-12 schools -- set this program apart from many other online educational leadership programs. The 30 credit M.A. in educational leadership and administration involves six credit hours of internship classes, in which a faculty member supervises a student’s work at an approved school in the student’s area. GW designs classes to be collaborative, and students work in groups using GW’s online tools to encourage each other to grow as education leaders. University of Illinois (U of I) is a public, research university with a main campus in Urbana-Champaign, IL. U of I is the flagship public university in Illinois and boasts a plethora of resources for its students. Full-time faculty members teach all classes at U of I, and their classes cover the same subject matter as on-campus classes. The online M.Ed teacher leader specialization prepares graduates for Illinois Principal's License. Many out-of-state students qualify for similar licensure upon graduation. This affordable master's in educational leadership requires 36 credits, and includes coursework in school data assessment, school finance, school management, and curriculum development. This program is intended for educators who have at least two to three years of teaching experience. Indiana University Bloomington (UI) is the flagship public university of the state. Based in Bloomington, IN, UI is also the largest university in the state based on student enrollment. The university offers over 100 online programs in addition to several hundred online classes. UI worked with Indiana public schools and school districts to offer its M.S.Ed in educational leadership program, and prepares graduates to make a direct and powerful impact as leaders of their school communities. This 36 credit, affordable online educational leadership degree requires 27 credits of core courses, with the final nine credits earned in a student’s concentration. Available concentrations include higher education and student affairs, learning sciences, school law, and leadership in educational organizations. Students may also design their own concentrations with the help of their academic advisors. The University of Texas Rio Grande Valley (UTRGV) is a public university with several campuses located in the Rio Grande Valley section of Texas, and a virtual campus serving remote students in Texas and beyond. The M.Ed in educational leadership develops cultural awareness among its students and emphasizes the stewardship of diverse school communities, particularly catering to English language learners. This online master's in educational leadership program offers courses in flexible, seven week sessions throughout the fall, spring, and summer. The 30 credit program covers school management, data assessment, school law, and curriculum creation. Students finish their degrees in as few as 10 months, which makes UTRGV ideal for educators looking to complete their advanced degrees at an accelerated pace. George Mason University, commonly called “Mason,” is the largest public higher education institution in Virginia. Based in Fairfax, VA, Mason also runs four satellite campuses in Virginia, a campus in South Korea, and an online campus for professional/nontraditional students. The school’s online campus facilitates over 50 fully online programs, including an M.Ed in education leadership program. Mason’s leadership master's degree online is an affordable option for in-state and out-of-state students, as all out-of-state online students receive a 40% tuition discount. Mason boasts a selective admissions process, with most students working as educators and holding above-average undergraduate GPAs. This 30 credit education leadership studies program is led by tenure track professors with significant experience in education research, and backgrounds as principals and superintendents. Applicants with master’s degrees in other areas of education may be eligible for 24-credit, abbreviated degree plans. Park University is a private university based in Parkville, MO. Park is one of the most affordable private higher education options in the state of Missouri and throughout the nation. Park University’s 32 online programs in business, healthcare, and education are affordably priced to increase students’ access to affordable, quality education. The online M.Ed in educational leadership program at Park uses a cohort model to establish a dynamic, collaborative learning experience for students. Park’s program is one of the best online ed leadership programs for the price. Park’s online ed leadership students must complete 30 credit hours, and the university requires additional credits for students seeking employment as middle school principals. In order to graduate, students need to maintain a 3.0 GPA. Additionally, applicants with undergraduate GPAs under 3.0 need to provide recommendation letters from supervisors in the education field. Brandman University is a private, nonprofit university with a main campus in Irvine, CA, and 25 satellite campuses throughout California, Washington, and online. Brandman belongs to the prestigious Chapman University System, and caters its degree programs to nontraditional students working full-time. The school offers a host of online programs, including an M.A.Ed in educational leadership program. The affordable online educational leadership degree at Brandman is designed for working educators seeking advanced academic credentials and who do not need to licensure in their states. Brandman students take 18 hours of core classes and 12 hours of concentration classes, which they work with their advisors to select. Their concentration classes are based on their individual career interests within the realm of education leadership. To be considered for admission, applicants with undergraduate GPAs under 3.0 must fulfill additional requirements, such as submitting GRE scores and teacher certification test results. The University of Texas at Tyler (UT Tyler) is a public university based in Tyler, TX. As a member of the University of Texas system, UT Tyler is a leader in online education in the state. The university’s online graduate degrees in education, the liberal arts, nursing, and business are rigorous programs that increase a graduate’s earning potential. The online M.Ed educational leadership is a highly competitive program that only accepts that leads to principal certification in Texas and prepares students to sit for principal certification exams in select other states. UT Tyler’s program is 30 credits -- less than many comparable degrees at other institutions. Students with master’s degrees in other fields of education may be eligible to complete the degree with as little as 22 credits. On average, students complete their degrees in one-and-a-half years. The University of Texas of the Permian Basin (UTPB) is a public university headquartered in Odessa, TX. UTPB boasts 27 online programs for undergraduate and graduate students. The master's educational leadership online program at UTPB leads to an M.A. in educational leadership, which can be completed in just 12 months. The program can be completed in an accelerated format, which features eight-week course sessions with six start dates throughout the year. UTPB’s graduates are prepared for careers as teachers and instructional coaches to principals and superintendents. The program is aligned with the State Board for Educator Certification competencies in Texas. Full-time faculty members with expertise in education teach 100% of this program’s courses. Students complete 36 credits, and their degree plan culminates with a practicum experience in the administration department of an approved school. University of North Texas (UNT) is a public university in Denton, TX known for the quality of its on-campus and online graduate professional programs. UNT’s M.Ed in educational leadership program can be completed in 12 months for full-time students. Five available start dates for courses throughout the year allow for extra flexibility and accelerated study, and courses are offered in eight-week sessions. Students with an earned master’s degrees in other areas of teaching can apply for UNT’s principal certification, which qualifies them to work as principals and superintendents. UNT’s traditional educational leadership program requires 30 credits of coursework, including three credits of internship experience in a school’s administrative office. The principal certification program requires 21 credits and does not include an internship. UNT prefers that its online master's in educational leadership applicants have prior teaching experience at a PK-12 institution, while principal certification applicants must have prior teaching experience to apply. University of Arkansas (U of A) is a public research university in Fayetteville, AK providing low-cost, high-quality degrees to online students. All online students receive in-state tuition rates, regardless of where they live, making the U of A an affordable, accessible option. U of A’s master's in educational leadership online is a top pick for current teachers looking to advance to school leadership positions. The program also prepares graduates to pass Arkansas’s School Leaders Licensure Assessment, and equivalent assessments in other states. U of A’s M.Ed educational leadership program is 33 credits, including three credit hours of a required internship experience. Many students complete their coursework in two years. Applicants must have a valid teaching license to apply, and those with a 3.0 or above undergraduate GPA do not need to submit GRE scores. Arkansas residents are eligible for grants to cover a portion of their educational expenses through the state’s Teacher Opportunity Program. Lehigh University is a private university in Bethlehem, PA, with several online programs for graduate students in healthcare, sciences, business, and education. The university’s 33 credit, online M.Ed in educational leadership introduces leadership theory, educational finance, data-based decision making for schools, school law, and instructional leadership. Courses are both synchronous and asynchronous, and depend on the professor’s preference. Synchronous courses are taught at night and during the weekends, and are highly interactive and collaborative. Lehigh’s leadership master's degree online is run on a fall, spring, and summer semester schedule. Applicants should have prior teaching experience and undergraduate degrees in education. This program does not require an internship/practicum to graduate. University of Colorado Colorado Springs (UCCS) has offered online degree programs since 1996, and currently boasts a wide selection of online bachelor’s, master’s, and doctorate programs. The M.A. in educational leadership program is one the College of Education’s top online offerings. 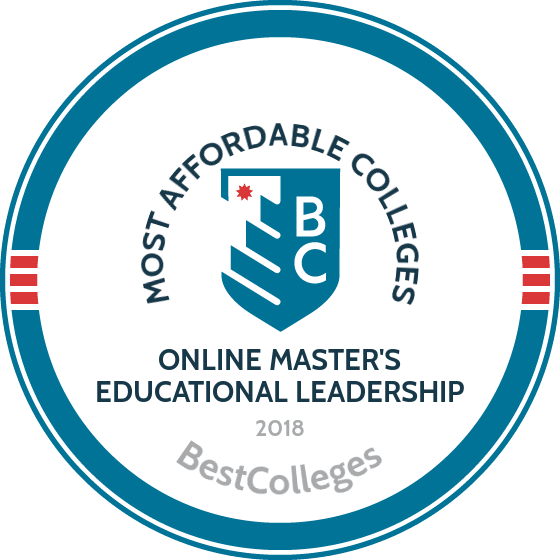 The university’s online educational leadership master's is notable for its affordability, and it adheres to the Educational Leadership Constituency Council (ELCC). Students in this 30 credit program complete a Master’s Research Lab, in which they conduct comprehensive educational research and present their findings to the professor. Applicants must have at least a 2.75 undergraduate GPA, a current teaching license, and three letters of recommendation from supervisors in the education field. Additionally, each applicant must participate in an interview with a faculty advisor. Arizona State University Online (ASU Online) is Arizona State University’s virtual campus, with over 30,000 students enrolled in 141 online degree programs. The university’s online M.Ed in educational leadership is an affordable, appealing option that prepares current teachers to become principals. The curriculum develops the skills principals need to run successful schools, including proper data assessment, interacting with school communities, leading teachers, and curriculum development. ASU’s 36 credit, affordable online educational leadership degree is delivered in convenient seven and a half week sessions throughout the year. Students being classes during any of the university’s six start dates. To culminate their degree, online educational leadership students complete an internship supervised by a faculty member and a research project. The University of West Florida (UWF) is a public university based in Pensacola, FL. UWF belongs to the State University System of Florida, and hosts a large number of students at its campus in southwest Florida, and many more online throughout the nation. UWF’s is a leader in online graduate education, and the online M.Ed in educational leadership is designed for educators looking to become principals, assistant principals, and district leaders. The Florida Department of Education fully endorses UWF’s online educational leadership master's program. Students should have three years of teaching experience prior to applying to this program. This 33 credit program requires students to pass the Florida Educational Leadership Exam prior to graduation. Students use UWF’s digital tools to work closely with a faculty mentor throughout their studies.